Have your summer festival plans been scuppered by parenthood, lack of babysitter, or simply the fact that you would rather spend your weekend with your children? 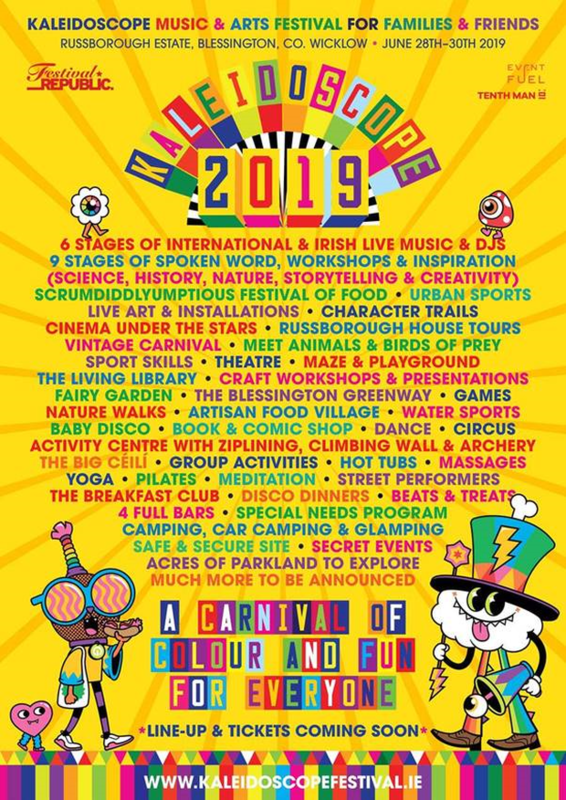 There's a new festival kicking off in June which may just be the answer - Kaleidoscope is a music and arts camping festival for families and friends. Inspired by Electric Picnic's Little Picnic's entertainment and family campsites, it is a festival offering music and DJs as well as programming for kids, and teenagers. Teens are often excluded from festivals who exclude those aged 12-18. Not this one. It really is one for all the family. There will be six stages for music and four full bars and a host of treats including nine stages of spoken word, workshops and inspiration (science, history, nature, storytelling, and creativity), as well as sports, nature walks, a fairy garden, ziplining, climbing wall and more. Full details of the music line-up, entertainment, and activities will be revealed soon, and there will be a loyalty ticket scheme for adults who have attended Electric Picnic in the past. The three day festival takes place across the weekend of Friday June 28 to Sunday June 30 2019 at the stunning Russborough House, Blessington, Co Wicklow. Check out www.kaleidoscopefestival.ie for more information.